Heat oven to 350°F. Cook noodles as directed on package. Meanwhile, in 3-quart saucepan, melt butter over medium heat. Add onion and garlic; cook 2 to 3 minutes, stirring occasionally, until onion is crisp-tender. Stir in flour; cook and stir until bubbly. Gradually stir in half-and-half, broth, sherry, salt and pepper. Heat to boiling, stirring constantly. Boil and stir 1 minute. Remove from heat and set aside. In medium bowl, mix egg, Parmesan cheese, ricotta cheese and 1/4 cup parsley; set aside. Drain noodles. In ungreased 13x9-inch (3-quart) glass baking dish, spread 3/4 cup of the sauce. Top with 3 noodles. Spread half of the crabmeat and half of the shrimp over noodles; spread with 3/4 cup of the sauce. Sprinkle with 1 cup of the mozzarella cheese; top with 3 noodles. Spread ricotta mixture over noodles; spread with 3/4 cup of the sauce. Sprinkle with 1 cup of the mozzarella cheese; top with 3 noodles. Spread with remaining crabmeat, shrimp and sauce. Sprinkle with remaining 1 cup mozzarella cheese. Bake 40 to 45 minutes or until cheese is light golden brown. Let stand 15 minutes before cutting. Sprinkle with 1 tablespoon parsley. Make it extra special by using refrigerated or frozen (thawed) real crabmeat in place of the imitation. Can't find ricotta cheese? Use dry-curd cottage cheese instead. 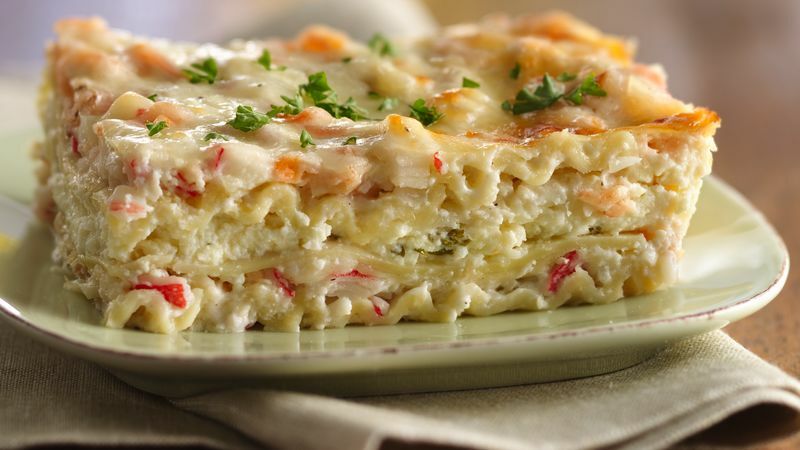 If you love creamy pastas and can’t get enough seafood flavor, this is the lasagna for you! Creamy seafood lasagna is just as easy to put together as your favorite classic lasagna, but the fresh-from-the-sea ingredients make it an extra special meal perfect for birthdays, anniversaries and even Valentine’s Day! What’s even better? This recipe delivers on flavor while also utilizing affordable imitation crab meat and frozen shrimp. You can even substitute cottage cheese for ricotta, if that’s what you have on hand. Overall, this lasagna proves you can have restaurant-quality food without leaving home! Keep exploring the wonderful world of lasagna recipes Betty Crocker has to offer, or pick up some tips on making perfect lasagne.